Someone recently told me that often a woman’s home is decorated in the colors that she prefers to wear. I had to respectfully disagree. My home is in earthtones, comfy colors that don’t scream at me when I get home from the studio. My wardrobe, on the other hand is pretty much based on black and white mixed with bold colors. It looks good for work, everything matches everything else and I feel like with a simple outfit I can go nuts with accessories. Here’s what I’m into right this minute… I love this dress from White House Black Market, and it gets even better with a chunky necklace. 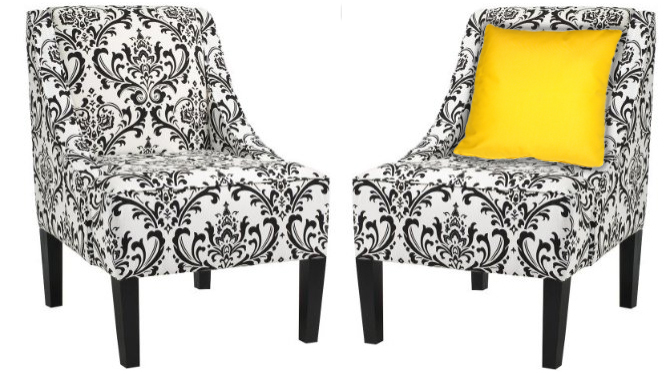 Here’s a chair from Target that I wish I had in my office, I would change out the throw pillow color with the season or my hormonally induced moods (might need LOTS of pillows, what color expresses “I want to punch someone in the throat”?). And here’s an idea that I am so in love with that I think I’m going to scour some antique shops and flea markets for cool black and white prints or paintings and find some vintage frames to paint. Yay, a fun summer project! 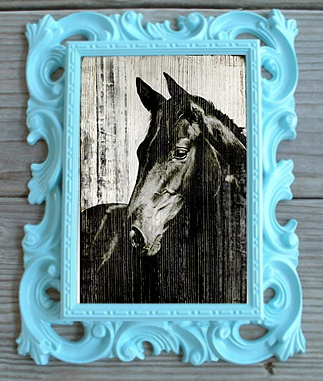 Frame from Etsy, print from Z Gallerie. So Cool. This entry was posted on 06/21/11 and is filed under color inspiration, home style, random goodies.